At Whittier College in California, the dignity of women and protection of their rights are top priorities – so long as they don't interfere with the political agenda of campus Islamists. Whittier President Sharon Herzberger, who was honored at a WNBA game last month for her commitment to the advancement of women, typically receives glowing press coverage like this and this. Children's Defense Fund President Marian Wright Edelman, a feminist icon, delivered this year's commencement address. Earlier this year Herzberger appointed a new dean for Whittier College Law School: Penelope Bryan, a scholar of family law who works to end discrimination against women in divorce cases. With this record, one would think the school would have enthusiastically welcomed a speech by Nonie Darwish, a native of Egypt who is scheduled to speak there this afternoon (12:30 P.M. Pacific Time) about the persecution of women under sharia. Darwish was invited to speak by the Whittier Republican Leadership Council. But her talk, which is being sponsored by the Clare Booth Luce Policy Institute, has drawn fire from student and faculty Islamists alike. And according to Brad Mahlstedt, head of the Whittier Republican group, the administration has responded to the pressure in a cowardly way. When Mahlstedt contacted school officials in July, they indicated that a speech by Darwish (who converted from Islam to Christianity) would not be a problem. Yet after some Muslim students complained, officials reversed themselves. They urged that Darwish's appearance be delayed until after Ramadan so as not to offend members of the school's "diverse" student population. Eventually Law School Dean Bill Carnahan agreed that Darwish could speak today. "I have spoken with members of our Muslim community, and there is no opposition, (albeit, some disappointment) with having Ms. Darwish speak in the month of September, so September 22 is fine," Carnahan wrote in an e-mail to Mahlstedt. Mahlstedt says that in the weeks leading up to the speech, opponents of Darwish's message have posted messages on Facebook and Twitter defaming her and suggesting she was somehow unqualified to speak about sharia. And while this slander campaign has been taking place, Herzberger and Bryan have been silent. Mahlstedt told IPT News that it is "hypocritical" for "Bryan and Herzberger to be totally absent in all of this. After all, these are individuals in leadership positions who get honored at WNBA games and have written law-review articles about discrimination against women in divorce hearings. Why then are they absent when it comes to standing up for Darwish's advocacy against the mistreatment of women under sharia? This is disgraceful." "Without ever researching the speaker, this administration was outright hostile to the idea of having Darwish speak on our campus due to the 'offense' it might cause," he said." Essentially Whittier Law School sought to stifle the very free speech they are supposed to be teaching us to promote and protect by attempting to prevent the event from happening in September." Why should Muslims "find it offensive to hear from a woman speaking out about a radical sect of Islamic fundamentalists that circumcise women, behead homosexuals and deny women equal rights to their children and equal rights under the law?" Mahlstedt added. "Instead of getting behind a heroic woman standing up for freedom and human rights, Whittier has cowered at the thought of offending someone." One of Darwish's harshest critics is Whittier law professor Seval Yildirim. Yildirim signed this petition (she is signature number 2552) calling for the release of imprisoned terrorist financier Sami Al-Arian. She signed this petition urging President-elect Barack Obama to boycott Israel, calling the Jewish State "racist" and charging it with perpetrating "crime[s] against humanity." And she joined the Council on American-Islamic Relations in suing to force the Philadelphia Police Department to allow a Muslim policewoman to wear a head scarf while on duty. Mahlstedt said that after hearing reports that Yildirim was discouraging Muslim students from attending Darwish's lecture, he tried to persuade her to change her mind. Yildirim refused, calling Darwish "uneducated, unqualified and a hate speaker," Mahlstedt said. Yildirim told IPT News she "fully" endorses the right of students to "hear all points of view on any issue." She added that Nonie Darwish "is not an academic, a lawyer, nor [sic] a qualified Islamic law scholar" and "her past speeches reflect a hateful and inaccurate perspective against Muslims." Yildirim did not provide any evidence for her assertion that Darwish has ever engaged in "hate speech" and there is none to be found in her writings. For Islamists, Darwish's life story – in particular her rejection of sharia and admiration for democracies like the United States and Israel – makes her a very dangerous person in the modern war of ideas. She grew up in a Muslim household in Cairo and Gaza. Her father Mustafa Hafez was a high-ranking Egyptian intelligence officer, selected by President Gamal Abdel Nasser to orchestrate fedayeen attacks on Israel from Gaza in the 1950s. After hundreds of Israelis were murdered by the fedayeen, Israeli agents assassinated her father in Gaza on July 11, 1956. Nonie Darwish was eight years old at the time. Nasser turned her father into a shahid (martyr) for the Palestinian cause. In her book, Now They Call Me Infidel, Darwish described how she became disillusioned with radical Islam after living in the Middle East for 30 years and witnessing Sharia's "cruel and inhumane" treatment of women. When Darwish was a teenager, the family maid became pregnant as a result of rapes by her boss at a home where she previously worked. "My mother, who did not want to send her back to her family because of the possibility she would be killed, sent her to a government facility," Darwish recounted. "A year later, we learned that the young maid was killed by her father and brother to protect the family honor." As she grew up, Darwish became increasingly disillusioned with the treatment of women under Islam. In 1978, she moved to the United States with her husband, eventually becoming a U.S. citizen and converting to Christianity. After the September 11 terrorist attacks Darwish began writing columns critical of Islamist radicalism and the silence of moderate Muslims. She created a group named Arabs For Israel, which describes itself as an organization of Arabs and Muslims who "respect and support the state of Israel" and want a "peaceful and diverse Middle East." The group calls for "constructive self-criticism and reform in the Arab world" and rejection of "suicide/homicide terrorism as a form of Jihad." These views have unsurprisingly made Darwish a target for Islamists as she speaks at campuses across the United States. Darwish recounted that at Wellesley College, "a large number of female members of the Muslim Students Association attended. As I described the plight of seven Iranian women awaiting death by stoning for sexual violations, I saw no compassion towards their sisters in Islam. I saw only rigid faces and hardened, unsympathetic hearts. Some even made faces at me as I spoke. These young, educated Muslim women live in America under the protection of the U.S. Constitution, far removed from the harsh realities of Sharia law I experienced." Read more here about the efforts to disrupt Darwish's Wellesley speech. See the reception Darwish received during a speech at the University of California-Berkeley here. It remains to be seen how far the Islamists and their allies are prepared to go to disrupt Darwish's speech tonight. Mahlstedt continues to receive angry e-mails and other messages from students claiming Darwish is somehow "unqualified" to speak, with one angry student claiming Darwish was unfit because she lacked academic "credentials" like a doctorate. As for the fact that she had experience living under sharia, that supposedly disqualified Darwish because, in the opinion of this student, "her views are quite skewed because of what she has lived." "Would you contend that a woman in the Nazi camps is unqualified to talk about the Holocaust?," Mahlstedt fired back. "If not, then why would you contend that a woman who lived the horrors of a sharia law system in Egypt is not qualified to speak about her experiences?" And while the Islamists try to silence Nonie Darwish at Whittier, prominent feminist role models like school President Sharon Herzberger and law School Dean Penelope Bryan appear to have gone AWOL. The view that some people take is that this woman was being silenced by being asked to not speak in a certain month. The speaker was not asked to refrain from speaking she was simply asked to change the date. This sit he type of religious accommodation that is made and many institutes in order to respect people religion not stamp it out as some have suggested the school has tried to do with Christianity. The argument that the deans should have been involved because people were publicly speaking out about the event on the internet is the same as saying they should have gotten involved to say this person could not speak. Both the speaking even and the students public opposition are freedom of speech and are protected as such. That is what this school teaches. That even though you are opposed to what is being said no form of speech should be stifled unless it is illegal. People are offended by what was said by the students and students were offended by the speaker being able to speak in a month that is sacred to their religion. Neither of these are illegal and neither were stopped because they are both protected by the freedom of speech. There are presentations put on all the time on campus about different cultures and offensive topics. The students have a right not to attend. There has been no formal protest with picket signs about a speaker the students simply voices their concerns. The school did what they were suppose to do in asking the presentation be moved from September to try and please all parties. The speaker would be allowed to speak and the students would not feel their religion was not being take into account. I believe the school acted in the correct diplomatic manner and that no one was harmed in the process. Could it be that Ms. Darwish's conversion to Christianity might have offended Muslim student, but they did not have the guts to come right out and say it, and instead used the ridiculous notion that she is unqualified to speak to an audience. I am a Nazi concentration camp survivor and despite the fact that I am not a sholar, I frequently speak to large ( and small) audiences. The conclusion I draw is that I would not be welcome at Whiittier College to speak about the Holocaust because I am not a sholar. And these students will one day be leaders in our society. God help us. It appears there is growing controversy surrounding both the event and now this particular article. From what I have gathered, this article and its author(s) are under attack by the Whittier school officials discussed in this article, accused of not seeking the proper avenue to voice their dissatisfaction and not showing due respect to the officials involved. While it's mind boggling to consider how exactly quoting the exact words that the school officials stated is offensive to them, let's consider their argument both in regards to the speaker and the article and see how it measures up. The discussion between the school officials and the organizing group largely revolved around the issue of offensiveness. The idea that no one should be offended ever by anything is a silly rule that has permeated so-called schools of higher learning. It is a ridiculous task ask someone to consider everyone else's sensitivities toward certain issues and base our every action upon what could possibly be construed as offensive. This creates a situation where the mere proposition of talking to people becomes a nightmare as we must neurotically self-censor ourselves on any opinion that could be construed as offensive. However, for some this is less of a problem than others. It is quickly becomes apparent to anyone who expresses a thought that goes against the majority that only a person whose ideas align closely with the common ideals will be immunized from the label offensive. For the rest of us, few as we are, our ideas must stay trapped within the confines of our minds. To express them is to be countered with condemnation not a rational argument. Hello Orwell's doublethink, goodbye free thought. The article directly quotes Yildirim as deeming the message to be one of hate speech. This term is tossed around so loosely these days that has degenerated into a demonizing tactic used to vilify and condemn any critique of opposing thought. There is a world of difference between actual hate speech and the alleged hate speech within this speakers message. Hate speech must necessarily have no logical basis. It must be a purely emotional argument, the operant word "HATE" being the label for an emotion. Blacks are evil and scary because they have dark skin is completely different than saying because Sharia law was the operating law in the country where Dawrish's alleged atrocities took place and were sanctioned, a country so focused on human rights like ours should be rightfully critical of it. The first is an emotional argument based upon irrational fears, the second a critique of a popular but damaging belief system. It may be said that this woman is participating in hate speech toward a certain group of people that believe a certain way. But if that is true then no one would ever have any basis to be critical about ANYTHING someone else believed in without also participating in hate speech. If the school officials are promoting their feminist agenda (or merely ANY agenda, however wrong or right), and that agenda offensive to the beliefs of another group, then by their own very definition they are hate speakers. The effect of this policy against offensiveness is to the detriment of society at large. It is not ideas that should be demonized, but rather it is the prevention of critical scrutiny that is necessary to expose hypocrisy and inconsistencies. And that is exactly what the school officials in this case are prohibiting when they make the claim that this article is in some way a violation of the Whittier honor code. They are afraid of having their hypocrisy exposed and shown for what it is, a blatant attempt at promoting their own agendas while subduing any that oppose. While I care little for the speaker's message ultimately, the circumstances surrounding her appearance are telling about the intentions of the school officials and reflects a pattern in society that is undermining the rights of everyone. Last, I do not agree with Mahlstedt's view that the school officials in question should have to support Darwish's message simply because of their affiliation with Feminism. I also think it is the wrong argument to pursue. It is obvious that their Feminist agenda is not about making perfect sense, let's not try to hold them to that as their entire foundation would crumble beneath them in result. Let's only hold them to moderating all group speaking engagements in similar regard, irrespective of their particular message and who it may "offend." Amazing: The secular elite (whether in government, media, or the academy) have such a visceral animus towards Christianity that they would stamp out its every manifestation. Yet -- without the slightest twinge of guilt for their blatant hypopcrisy -- they gladly engage in coprophagia with every ridiculous dung-laced argument that the Islamists place on their plate. DHIMMIS! Nonie Darwish is a hero in my book, all the way. She is a voice speaking in the wilderness about Sharia Law and the inhumane treatment it heaps upon the women of Islam. She has lived in it, watched it and has come to abhor it. I find it truly absurd that feminists of all stripes, liberal publications and websites seldom come to the defense of Islamic women, or condemn Sharia law. What should be their blue plate special is a tainted basket of political correctness and multicultutal toxic stew. While Ms. Darwish picks up the cross for women persecuted under Sharia law, the leftarded women refuse to rise to the ocacsion. Why? They are afarid they will be seen as attacking Islam, Sharia law and speaking out AGAINST such evil and stone age treatment of Islamic women. The liberals and feminists do not want to be in the glare of the spotlight of condemning Islam or the 'noble' culture of Sharia law. Why, they might be called out for being insensitive towards Islam, Sharia Law and not being oh so multicultural and politically correct. Nothing wrong with that. Nonie Darwish is willing to take them all on. The Muslim students, faculty and Islamic organizations that are alawys attacking her and her positions. These retards of the feminazi movement, the radical left KNOW that Ms. Darwish is right about all of this. She is one of the greatest champions for women's rights within the Islamic world. 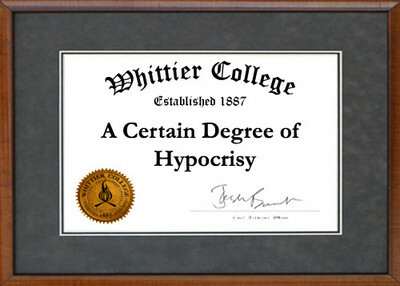 Whittier College is almost acting like the other institutions of higher education that have come out against anyone who dares to sepak out against Islam, esepcially on behalf of Islamic women. Other colleges like East Tennessee State University, Uc Irvine, UC Berkeley, USF, Cal State Fullerton are becoming hotbeds of Islamic intimidation for anyone who dares to speak out against Islam, Sharia law and the way women are abused by such perverted and backwards institutions. People like Nonie, Robert Spencer, Pamela Geller, Andrew Bostom are our canaries in the coal mines. If we do not stop and listen to them, take a stand, then by the time the canaries have stopped singing, it may be too late for the rest of us. Nonie Darwish speaks for those women who have lost their voices and their lives to Islam and Sharia law. We MUST listen and act boldy. Ms. Darwish has set a fine example for us here and we owe it women all over the world supressed and persecuted under Islam to speak and take action. One thing we can count on, the feminists and liberals will not and that is why we must.